Soil is actually a layered material, not in the sense that it is deposited in layers, but rather it has a variable composition with depth. A second A-horizon may be directly below and it contains humus which is the more decomposed residue of the o-horizon organics. It has usually been leached of the more soluble material, and the finer clay particles have subsided out. (E-horizon) not always present - A light colored layer that lacks the dark oxide coating of the other layers. Often found in acid soils under forests. 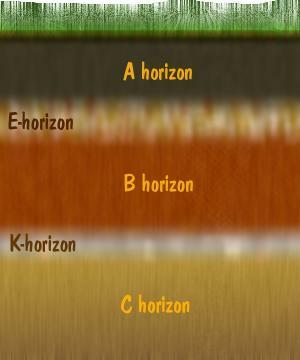 The B-horizon is the collecting point for much of the clay material. It tends to be dense (closely packed) and often is brown to red in color. (Due to the iron leaching from above.) It has limited (but some) organic material. The C-horizon is the least weathered and at the bottom of the profile. It still contains many mineral grains that have not undergone complete weathering or leaching. The character of a given soil changes with it location and the local climate. Soils can be classified in a similar way to rocks. They are classified by their distinctive physical and chemical properties. The soil classification system used in the United States separates soils into 11 types. Mainly contain organics - cold temperature inhibits weathering, and prevents leaching to depth. Poor separation of layers. A wide range of soil types that are very dependent upon the vegetation material growing in them and the amount of water they receive. Some of the best farming soils are derived from this type. They tend to form strongly alkaline soils (non-acidic) because they are created with very sparse vegetation. They often contain a large percentage of carbonate. These soils have been heavily leached because of high rain fall, hence they contain a low level of chemical nutrients. they have high clay content and will swell and shrink during the rainy season.